Harderian gland - Atrophy in a female B6C3F1 mouse from a chronic study. 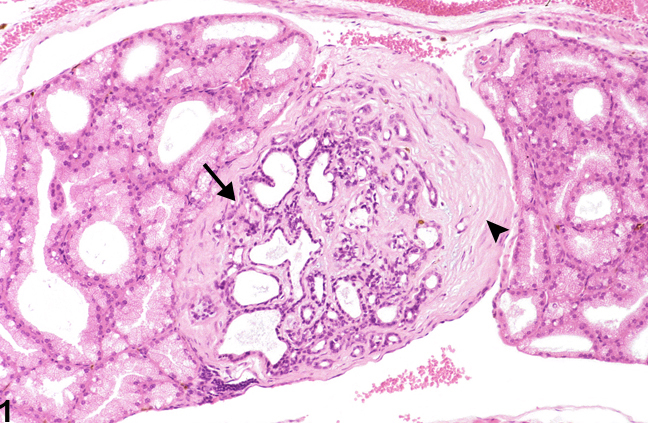 The alveoli are shrunken, tortuous and lined by variably flattened epithelial cells (arrow), and there is concurrent interstitial fibrosis (arrowhead). 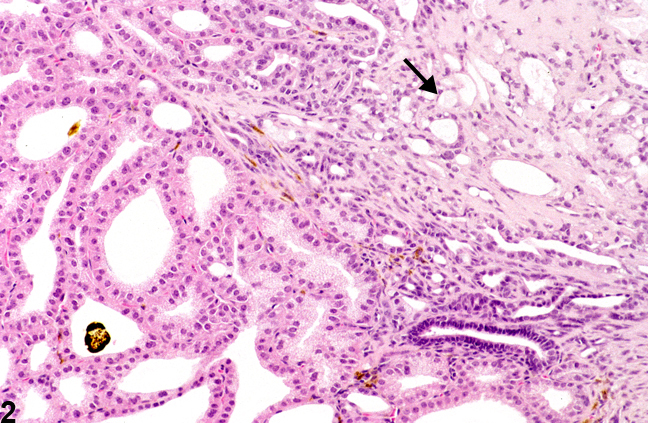 Harderian gland - Atrophy in a female B6C3F1 mouse from a chronic study. 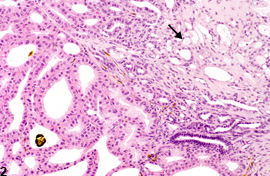 Higher magnification showing the shrunken, tortuous acini with the variably flattened epithelial cells (arrow) and the interstitial fibrosis in more detail. Harderian gland atrophy (with or without concurrent fibrosis) results from various causes, including trauma from retro-bulbar bleeding procedures; genetic mutations; nutritional deficiencies; as a reaction to foreign bodies or accretions of excess porphyrin secretory material; or as a sequel to degeneration or inflammation from various causes. The lesion is characterized by alveoli that are shrunken to slightly widened, tortuous, and lined by variably flattened epithelial cells ( Figure 1 and Figure 2 ). Atrophy is often accompanied by interstitial fibrosis. Harderian gland atrophy should be diagnosed and assigned a severity grade whenever present. Any associated reactive fibrosis should not be diagnosed separately unless warranted by severity, but should be described in the pathology narrative. Other associated lesions (such as inflammation) should be diagnosed separately. If atrophy is a main component of another lesion (such as inflammation or fibrosis), it need not be diagnosed separately (unless warranted by severity), but should be described in the pathology narrative. Krinke GJ. 1991. Atrophy and sclerosis. Harderian gland, rat. In: Eye and Ear (Jones TC, Mohr U, Hunt RD, eds). ILSI Monographs on the Pathology of Laboratory Animals. International Life Sciences Institute Press, Washington, DC, 137-140. Lambert RA, Yudkin AM. 1923. Changes in the paraocular glands accompanying the ocular lesions which result from a deficiency of vitamine A. J Exp Med 38:25-32. National Toxicology Program. 1983. NTP TR-244. Toxicology and Carcinogenesis Studies of a Polybrominated Biphenyl Mixture (Firemaster FF-1) in F344/N Rats and B6C3F1 Mice (Gavage Studies). NTP, Research Triangle Park, NC. National Toxicology Program. 1997. NTP TR-461. Toxicology and Carcinogenesis Studies of Nitromethane (CAS No. 75-52-5) in F344/N Rats and B6C3F1 Mice (Inhalation Studies). NTP, Research Triangle Park, NC. Percy DH, Wojcinski ZW, Schunk MK. 1989. Sequential changes in the Harderian and exorbital lacrimal glands in Wistar rats infected with sialodacryoadenitis virus. Vet Pathol 26:238–245. Puk O, Esposito I, Söker T, Löster J, Budde B, Nürnberg P, Michel-Soewarto D, Fuchs H, Wolf E, Hrabé de Angelis M, Grew J. 2009. A new Fgf10 mutation in the mouse leads to atrophy of the Harderian gland and slit-eye phenotype in heterozygotes: A novel model for dry-eye disease? Invest Ophthalmol Vis Sci 50:4311–4318. Van Herck H, Baumans V, Van Der Craats NR, Hesp APM, Meijer GW, Van Tintelen G, Walvoorts HC, Beynen AC. 1992. Histological changes in the orbital region of rats after orbital puncture. Lab Anim 26:53-58.